Hello, my name is Tracy Hopkins and I would like to welcome you to Whispurrpaws Persians & Himalayans, established in 2000. Whispurrpaws is a small, cageless, caring, in-home hobby cattery located in Oquawka, a small town in west-central Illinois. I raise beautiful, happy, healthy CFA registered Himalayan and CPC Persian kittens in the adorable doll faces, beautiful flat faces, as well as the gorgeous extreme faces, or CFA standard type. I specialize in most Himalayan colors, including the flashy bi-color points, or Himalayans with white spotting. Persian colors include all solid colors (excluding solid white), bi-colors/calicos/vans in both dominant and dilute colors, and the parti-colors of tortoiseshell and blue-cream. Chocolates, lilacs and carriers of this gene will also be available on occasion. My Persians are CPC, which stands for color point carrier. This simply means they have the ability to produce Himalayan offspring when bred to a Himalayan or another CPC Persian. ALL Whispurrpaws cats and kittens are raised exclusively INDOORS in a clean, non-smoking home. They are raised "underfoot" as part of my family and NEVER in cages. My kittens are lovingly handled and socialized from the moment they are born. 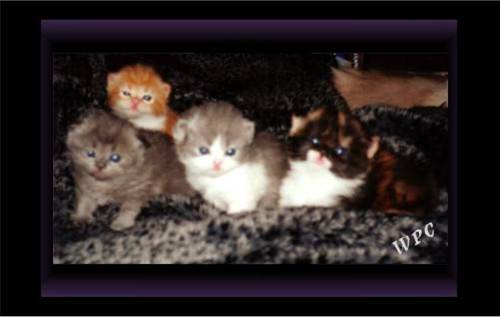 Therefore, they have exceptional, loving "purrsonalities" and make absolutely wonderful additions to your family!! Whispurrpaws is a CLOSED CATTERY and offers absolutely NO stud service!! There are no exceptions, so please do not bother asking! The health of my cats and kittens is of the utmost concern to me. Therefore, I DO NOT offer stud service to queens outside of my own cattery. Thank you very much for understanding my views and policies concerning this issue. If you decide a "Whispurr-Baby" is right for you, please do stay in touch with me!! I NEVER forget about any of my kittens once they leave my care and I certainly want to know how your kitten is doing. Updates and pictures are greatly appreciated!! I also encourage my kitten owners to contact me should they have any questions or concerns at any point in their kitten's lifetime. I love each and every kitten born in my cattery, therefore I make myself available day or night, it doesn't matter. Please take a look around my website and enjoy your visit! If you have any questions, pleasedon't hesitate to e-mail me. Don't forget to sign my guestbook before you leave! Beauty, Health & Purrsonality Plus! !